Identification: Antennal club is white. 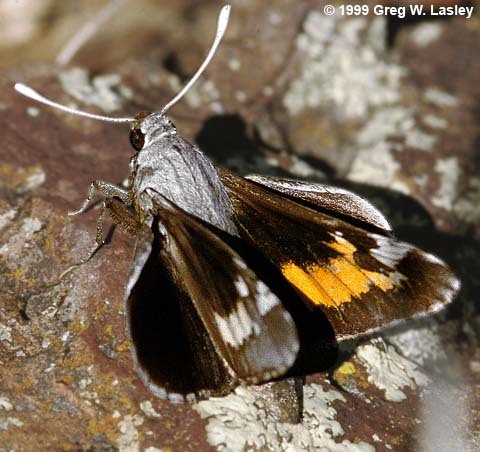 Upperside is black; forewing has white spots near the apex and a wide band varying from yellow to orange; hindwing has no markings. Underside of hindwing is gray with 2 white spots near the costa. Wing Span: 2 1/2 - 3 inches (6.3 - 7.6 cm). Life History: Adults have a rapid flight. Females glue eggs singly on leaves of the host. A young caterpillar eats leaf tips and then burrows into the root and makes a tent. Older caterpillars hibernate in their tents and eventually pupate there. Chrysalids can move up and down in their tents. Flight: One brood from May-August. Caterpillar Hosts: Schott\'s yucca (Yucca schottii), Arizona yucca (Y. arizonica), banana yucca (Y. baccata), and Torrey's yucca (Y. torreyi). 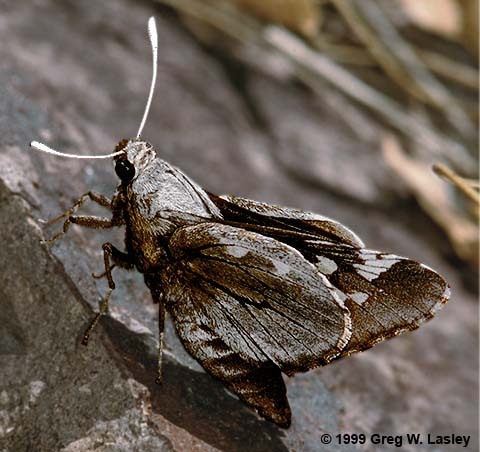 Adult Food: Adults do not feed, but males sip moisture from mud. Habitat: Grassy shrubland and open yucca-oak woodland. Range: Rare and local in the mountains of southern Arizona, southern New Mexico, southwest Texas, and northern Mexico.